Like the true skincare junkie that I am, there is nothing better than sampling a new selection products and seeing how they perform on my skin. For the past month and a bit I have been trialing the Alpha-H A-List Kit*, and in true Alpha-H form these products have been delivering the goods. The kit comes with 5 of Alpha-H's award winning AHA products, including the infamous Liquid Gold. I have previously tried and reviewed Liquid Gold before, so knowing how well it already worked with my skin I was excited to incorporate similar products into my routine - this girl loves her AHA's people! I've been lucky enough to try this cleanser a few times before (thank you free mini samples!) and I've liked it each and every time. This is a rich, gentle cream cleanser that almost feels a bit like a face lotion in consistency. Now, I'm not usually a fan of cream cleansers and normally steer towards the gel variety as I find that milk or cream cleansers don't really leave my skin feeling clean and can sometimes feel like it has left a bit of greasy film on my skin. However, that is not the case with this cleanser. After use, my skin is left feeling quite clean and fresh, yet still moisturised and comfortable and not at all greasy - big ticks for all the oily skin gals. It doesn't contain any AHA's but instead has Aloe Vera extract and Vitamin E that has quite a calming and balancing effect on the skin. This can be used to remove face and eye make-up up but I have used it for my second cleanse after my make-up was already removed. While I did like this cleanser, I didn't love it so I probably wouldn't go as far as to buy the full size but I would highly recommend it for those with dry and dehydrated skin. I've always loved these types of Exfoliators as they are a bit of fun - but can get a bit messy if you're not being careful. After cleansing, I pour about 1 teaspoon of this exfoliant into my palm and add a few drops of water to create a smooth paste. I then slather it all over my skin and rinse off in circular motions after about a minute. This is very similar to the Dermalogica Daily Microfoliant, which I find a bit more exfoliating than this but the Alpha-H one is extremely gentle while still being a light exfoliator, perfect for sensitive skin. This contains Kaolin (White China Clay) and Pineapple and Papaya Extract. This stuff is definitely holy grail status for me. I've previously talked about if Liquid Gold was worth the hype and let me tell you, it is worth it and so much more. Liquid Gold is essentially a skin resurfacing toner packed full of Glycolic Acid (my fave). As I've mentioned in previous blog posts, Glycolic acid is amazing for skin pigmentation, scarring and uneven skin texture. If you are like me and have acne scarring this is perfect for that. Alpha-H recommend for it to be used every alternate night after cleansing the skin and you are left a a brightened skin tone and a smoother skin complexion. I cannot rave about this product enough! Using AHA products leave your skin highly sensitised to the sun, so it is extremely important to wear sun protection with a high SPF. This product in particular is SPF50 so it is perfect to shield and protect your skin from the sun. Initially I thought this was slightly tinted but once rubbed into skin the tint disappears. The most important thing for me when choosing sun protection other than a high SPF is that is non-greasy and this one definitely fits the bill and actually leaves the skin feeling quite matte. It also has added Pomegranate Seed Oil that works to keep the skin hydrated and smooth. I used this on my face on a day that spent by the beach in the sun all day (and it was quite the scorcher!) and my pale lily white skin did not burn one bit - which is quite amazing for me as I almost always get burnt cheeks after going to the beach. This would have to be one of my new favorite products. This mask is like an amplified version of Liquid Gold and packs a lot in its punch. It has 15% Glycolic Acid and Alpha-H recommend that it only be used once a week for a maximum of 10 minutes. When applied, my skin felt quite tingly but not in an uncomfortable or burning sort of way (though I wouldn't recommend applying it to open or broken skin). Once removed you could instantly feel and see the results. My skin was much more refined, brighter and smoother. I found after using this spots would also disappear much quicker. Once I finish this sample I will definitely buy the full size product, it is definitely the best exfoliating mask that I have tried. Overall, this kit is a great way to sample a mix of some amazing products from Alpha-H if you haven't tried anything from the brand or are looking to try even more. The clear winners for me were Liquid Gold and the Liquid Gold Smoothing and Perfect Mask. 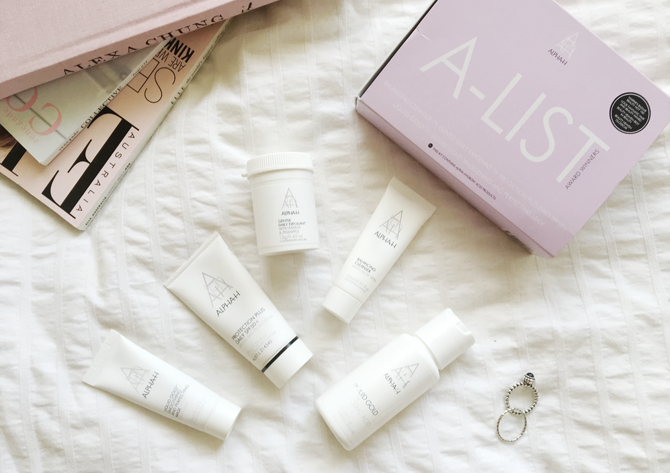 Alpha-H A-List Kit usually retails for $69.00 but is currently on sale for $54.56 on Activeskin. I highly recommend purchasing this kit - so why not buy it now while it is on sale AND pick up some your fave skincare goodies while you are at it. Treat yo self people, treat yo self! Have you tried any of these products before? What are your favourite Alpha - H products? I've tried Liquid Gold and the cleanser from Alpha H! Liquid gold is soooo amazing! Definitely notice almost instantaneous results. The cleanser is nice though nothing remarkable, like you say. The mask sounds phenomenal! Definitely one I know I'd love! I'd love to try some bits from Alpha-H, I feel like I always hear good things about their products (especially the liquid gold). This sounds like a great set to try all of Alpha H's popular products! :-) I am intrigued by the balancing cleanser! It sounds like the perfect morning cleanser! I need this products ASAP! This sounds like a great set to try all of Alpha H's products! I have heard many good things about this brand! The Protection Plus Daily sounds great, I'm always on the hunt for a good sunblock.